Given how little time and funds I have to sew, I am learning to make what I have stretch in a lot of ways...a method popular "back then". Not to mention with my modern wardrobe. First, we know that the wrap-front dress can be worn with a "body", to make an afternoon ensemble, or an evening ensemble, depending on how it is accessorized. 18th Century Sewing Techniques has an example used for evening dress. Second, I can simply wear it like an open robe, with a petticoat peeping out underneath. 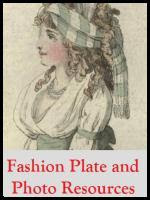 Here is a 1799 fashion plate from The Fashions of London and Paris, from the Bunka Gakuen library collection in Japan. 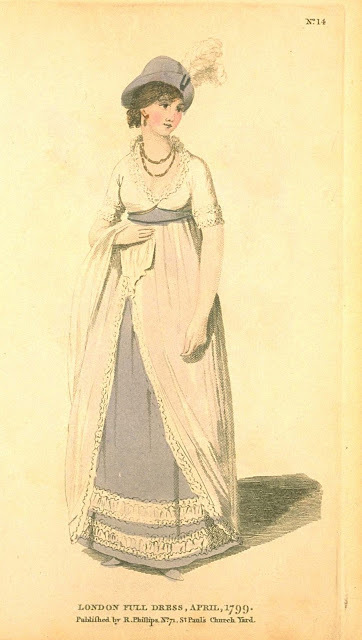 This particular example is full dress, meaning that it would be suitable for dinner or an evening out. Memo: the fabric the model is wearing around her arm is not a shawl, it's the train from her dress. Hat of lilac crape, looped up in front; with silver loop and button; ostrich feathers; robe of muslin; petticoat of lilac crape; both trimmed with lace. Lilac belt, trimmed with silver; gold chain. A handsome hat, small plumes, sash and matching petticoat, and necklace--oh, and shoes--, and voila, we have yet another ensemble. In my case, I already have everything to hand. Just need to mix it around a bit. Or I can take fabric from my stash and run up a petticoat in another color. No expense whatever. That hat...Polly and Jenni, what do you think? The original is felt. I love your idea of double duty. I do the same with my bustle era gowns, using the same black skirt under different bodices & bustle aprons. Makes for quicker outfits to be done. 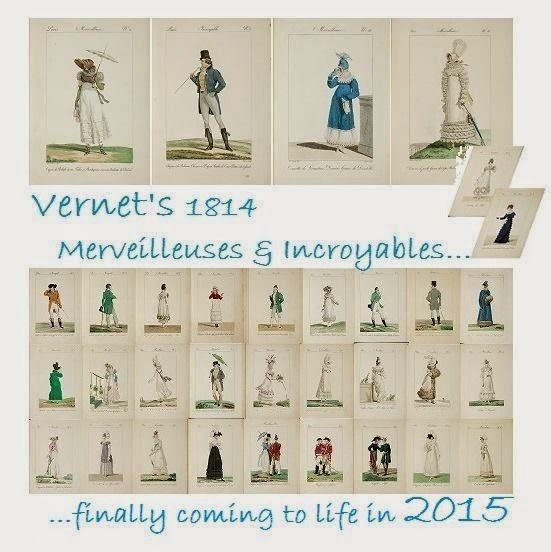 I also have two 1795 open robes but they're very dressy so I haven't had much chance to wear them. Yes, yes, and more yes! I love the whole ensemble. 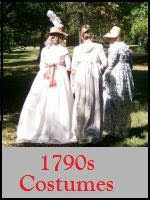 1799 is later than the mid 1790's that you've done in the past, and change is good! Cool! It's a done deal then. Val, it's good to hear you re-use, too. I remember one of your open robes, and just went back to look at...the periwinkle one. The color is l-u-s-c-i-o-u-s, and the trim! Jenni, you need to look at it. It's at http://timetravelingincostume.blogspot.com/search?q=open+robe. I've never had a chance to wear my pink one. Love the hat. What a pretty ensemble. And the lilac is quite sweet. I do prefer the 1790-1800 stuff more than the 1800-1820 stuff. Oh, my gosh!! Even better!! How did you trim it? It's one of the handsomest I've ever seen! I used a gold metallic trim all around it, and a stiff white lace around the neckline. The hem of the dress, which doesn't show here, had a very wide net trim with gold metallic designs on it. I used Butterick 4890 for it, and extended the front underbust to get that closure. I have a fancy rhinestone pin in the middle of it.